Computers are changing the way we see the world — but are they also changing the way we see? These days, it’s rare to find someone who doesn’t spend hours everyday on a computer, and doctors are seeing more cases of Computer Vision Syndrome (CVS), which is caused by just that. Poker players easily spend more time staring at a computer screen than the average office worker, particularly with extremely focused attention. So, we're going to take a look at some information and strategies for preventing a case of CVS or general eyestrain, which can have quite a negative impact on your mental game. computer screen in a way that reduces reflections and glare from windows or lights. looking at, the harder your eyes have to work. A good rule is to apply the Harmon Distance (the distance between the elbow and first knuckle) as a guide. eye exam to help detect underlying vision problems. If you wear contact lenses, there is even more reason to ensure that you keep your eyes lubricated. Dr. Kurt J. Hofeldt explains that when we try to focus on back-lit products, our eyes don't blink as much. This causes our eyes to dry out quickly. Patients wearing contact lenses need even more moisture and a better tear film to maintain better eye comfort, health, and vision. If a patient's contact lenses dry out, the lens can easily stick to the eye and upon removal from a dry eye can damage the epithelium (top skin layer of cornea), potentially leading to other problems. How About a Pair of Glasses? Chemistrie lenses are a magnetic lens system that fits over your current eyeglasses by simply clipping on or off with tiny magnets. The yellow or rose colored polarized lens helps to reduce the glare from the computer screen and increase comfort during extended use. Of course, all poker players have a beloved pair of sunglasses that they wear at the live poker table, and you can have selected types of sunglasses fitted with this technology also for your online sessions. If you don't already own glasses, then Gunnar Eyewear (pictured above) is another great option that's specifically designed for gamers. 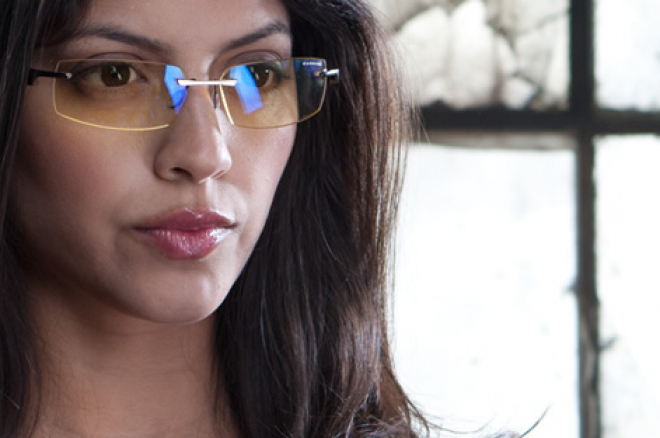 They offer yellow-tinted glasses designed to help reduce eyestrain and glare for extended computer use. These are highly recommended by many optometrists. You can pick up a pair of Gunnar Eyewear at your local Best Buy. It is also believed that the liver nourishes and moistens the eyes. When the liver is deficient in the required nutrients, it can cause problems such as blurry vision, myopia, “floaters” (dark specks, spots, threads or clumps in front of your eyes), color blindness, or dry eyes. When there is a "heat" in the liver, eyes are likely to be bloodshot, often with a painful or burning sensation. If you feel like you need an additional boost to your eye health, then perhaps try the herbal product EyeCare™ by Canfo, which focuses on providing the liver with the nutrients needed for overall liver health and wellness, which could then ensure that your eyes are nice and prepared for when you finally reach that final table. While this should never replace a full eye examination by a professional, why not test your eyes now on your iPhone or iPad for a bit of fun? I downloaded Vision Test by 3 Sided Cube Design Ltd, which measures your visual perception, long-distance vision, and color accuracy. According to the app, my lifestyle maybe be affecting my eyesight, hence my motivation to write this article! Follow @PokerNews on Twitter to find out when the next edition of Stay Stacked is released, helping improve your overall health and well being as a poker player. *Lead image courtesy of Gunnar Eyewear. Stay Stacked: A Bodyweight Workout You Can Do Anywhere!